Kinlocheil to Fort William. 12 Miles. The walk from Kinlocheil to Fort William was mostly along the road that ran along the northern shore of Loch Eil. It wasnt until I reached Corpach that I was able to drop down into the village and get away from the traffic. The photo above shows the first of a series of locks that take boats up through the Great Glen to Inverness, thereby cutting out the long western route up past Hebrides islands. 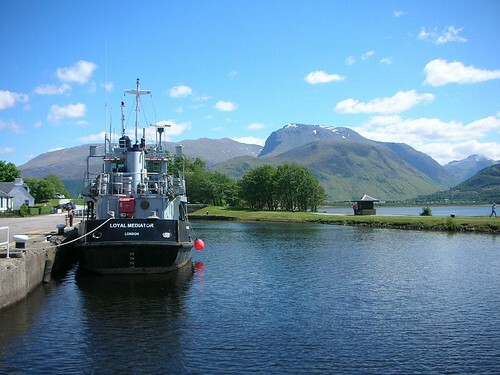 Corpach is the starting point for a series of interconnecting locks knows as Neptune’s Staircase which take the boats up to the level of the Loch Ness from sea level. While I was there I was fortunate to see the lower lock in action and it was surprising how quickly the water level from the top lock fell, filling the lower one up and allowing the boat to float higher in the water. The end of the day’s walking ended in Fort William. I dont know what it is about this place. This is a major town lying under Ben Nevis and in theory should be a vibrant place with cafes etc but it always looks down at heel with the usual crappy tourist tat shops. Despite pedestrianising the main street some years ago, there doesnt seem to be much happening. Maybe its just me and it were having an off day. You are currently browsing the Scottish Coastal Walk blog archives for the day Saturday, May 17th, 2008.